Employees State Insurance Corporation (ESIC) Recruitment 2017, In the Employees State Insurance Corporation (ESIC) Recruitment 2017, Current Govt. Jobs for Professor/ Associate Professor/ Assistant Professor at the Employees State Insurance Corporation (ESIC) Recruitment 2017. Employees State Insurance Corporation (ESIC) Recruitment 2017 Professor/ Associate Professor/ Assistant Professor Posts April 2017, Employees State Insurance Corporation (ESIC) Recruitment 2017 have been decided to recruit Professor/ Associate Professor/ Assistant Professor Posts Advertisement Date 21st April 2017. Important Dates which candidate should remember when applying Employees State Insurance Corporation (ESIC) Recruitment 2017 as follows. Probably you are waiting for this Employees State Insurance Corporation (ESIC) Recruitment 2017 Notification you can apply online Employees State Insurance Corporation (ESIC) Recruitment 2017 posts Professor/ Associate Professor/ Assistant Professor. Now the question is who can apply the Employees State Insurance Corporation (ESIC) Recruitment 2017 Job, -Well those are planning to apply for this / these Professor/ Associate Professor/ Assistant Professor Posts should have the following minimum eligibility criteria. Also Check the Advertisement Details. Relaxable up to five years for employees of the Employees’ State Insurance Corporation and the Government Servants in accordance with the Instructions or orders issued by the Central Government from time – to time. Rs. 15600/- to Rs. 39100/- with G.P. of Rs. 6600/plus Non Practicing Allowance. A Demand Draft of Rs. 225/-(as applicable) in favour of ‘ESI Fund Account No. I’, drawn on any scheduled bank payable at ‘Kolkata’(in case of application for ESIC PGIMSR & Medical College, Joka, Kolkata) OR payable at ‘Hyderabad’ (in case of application for ESIC Medical College, Sanathnagar, Hyderabad)has to be submitted along with the Application Form. i. Fee once paid will not be refunded under any circumstances. ii. Only Demand Draft drawn on any Scheduled Bank will be accepted. Application Fee paid by any other mode will not be accepted. iii. The Demand Draft must be issued after the date of issue of this advertisement. How to Apply Online ESIC Recruitment 2017 ? The Eligible candidates can apply to the post through the prescribed format application form which is available to download at official website http://esic.nic.in/. Fill the application form as per Guidelines given in the official notification and enclose other necessary documents and submit to the official address on or before 02.05.2017. 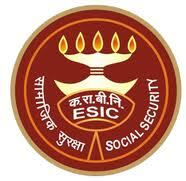 The Interested candidates who are going to apply Employees State Insurance Corporation (ESIC) Recruitment their selection process will be based on Interview.